Programmable Polyphonic Synth-Module Works with All MIDI Keyboards and MIDI Control Devices. The EX-800 is a programmable synth-module that works as a sound source for any MIDI key-board (DW-6000, Poly-800, RK 100, etc.) or other MIDI control device such as computer or synthesizer. For real versatility, it responds to eight kinds of MIDI data: key data, pitch bends, modulation, sequencer clock, pro-gram change, volume, computer dump, and active sensing. The MIDI THRU jack allows series connection with additional EX-800s or other MIDI units. This is an easy way to add extra musical power to your system with but a small investment. 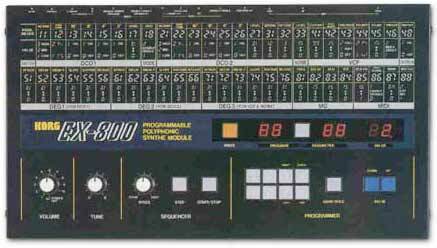 The EX-800 has eight voices, 64-program memory, and a built-in 256-step polyphonic sequencer. Dual DCOs and triple ADBSSR DEGs permit rich tonal variation and flexible envelope shaping. There's even a tape interface.